NEW YORK (AP) -- Intel Corp., the world's largest chipmaker, on Thursday said its fourth-quarter net income fell 27 percent from the previous year, as PC sales continued to weaken. Net income was $2.47 billion, or 48 cents per share, for the October to December period. That was down from $3.36 billion, or 64 cents per share, a year ago. Intel still beat earnings expectations for the quarter by 3 cents per share relative to the average of analysts polled by FactSet. That was due to slightly higher-than-expected prices for its chips and lower-than-expected costs for starting up new production lines. Revenue fell 3 percent to $13.5 billion, matching analyst expectations. Intel is challenged by a shift in consumer spending from PCs — most of which use Intel chips — to smartphones and tablets, which don't. Research firm Gartner said this week that global PC shipments fell 4.9 percent in the fourth quarter from a year ago. Households are letting tablets replace their secondary PCs, it said. On a call with analysts, Intel chief financial officer Stacy Smith admitted that tablets are affecting sales of PC chips, which fell 3 percent in the quarter. 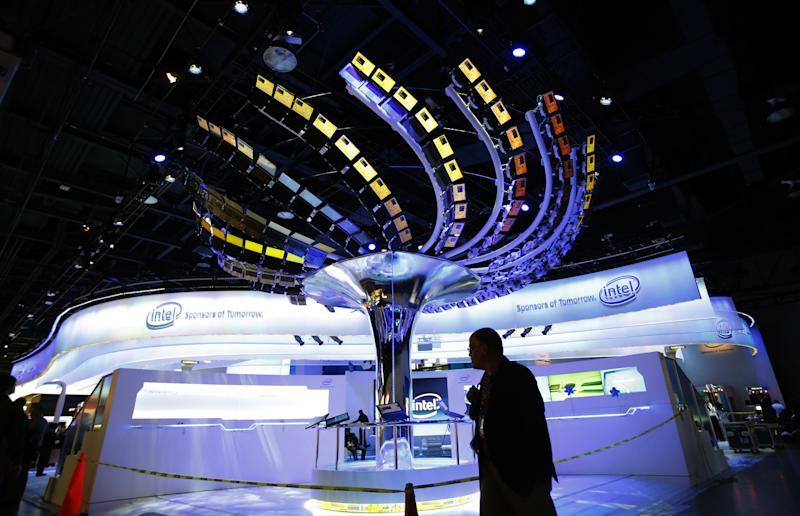 Intel is trying hard to get its chips into smartphones and tablets. On the call, CEO Paul Otellini touted the company's latest "Atom" processors, which are used in ten tablet models, he said, and can yield the same or better battery life as the competition. Intel had warned that the fourth quarter would be lackluster, and that the usual holiday bounce in PC shipments would be cut in half, even though Microsoft launched its new operating system, Windows 8, in the quarter. The Santa Clara, Calif., company expects about $12.7 billion in first-quarter revenue, below the analyst forecast of $12.9 billion but in line with usual seasonal variations. For the full year, Intel is forecasting a revenue percentage increase in the low single digits, in line with Wall Street's 2 percent expectation. Intel shares fell $1, or 4.4 percent, to $21.68 in afterhours trading, after the release of the results. That more than wiped out the day's gain of 57 cents in regular trading. For the full year, Intel earned $11 billion on $53.3 billion in revenue. Both figures were down slightly from the year before, when it earned $12.9 billion on $54 billion in revenue.